The European Rugby Champions Cup (known as the Heineken Champions Cup for sponsorship reasons) is an annual rugby union tournament organised by European Professional Club Rugby (EPCR). It is the top-tier competition for clubs whose countries' national teams compete in the Six Nations Championship. Clubs qualify for the Heineken Champions Cup via their final positions in their respective national/regional leagues (Gallagher Premiership, TOP 14, and Guinness Pro14) or via winning the second-tier Challenge Cup; those who do not qualify are instead eligible to compete in the second-tier Challenge Cup. Between 1995 and 2014, the competition was known as the Heineken Cup but was changed to European Rugby Champions Cup, following disagreements between its shareholders over the structure and governance of the competition. Heineken returned as sponsor for the 2018–19 season, running the competition alongside the EPCR, resulting in the competition being known as the Heineken Champions Cup. Leinster are the current holders of the title, having won their fourth title by beating Racing 92 in the 2018 final. Leinster Rugby and Toulouse have both won the competition a record four times. The Heineken Cup was launched in the summer of 1995 on the initiative of the then Five Nations Committee to provide a new level of professional cross border competition. Twelve sides representing Ireland, Wales, Italy, Romania and France competed in four pools of three with the group winners going directly into the semi-finals. English and Scottish teams did not take part in the inaugural competition. From an inauspicious beginning in Romania, where Toulouse defeated Farul Constanţa 54–10 in front of a small crowd, the competition gathered momentum and crowds grew. Toulouse went on to become the first European cup winners, eventually beating Cardiff in extra time in front of a crowd of 21,800 at Cardiff Arms Park. Clubs from England and Scotland joined the competition in 1996–97. European rugby was further expanded with the advent of the European Challenge Cup for teams that did not qualify for the Heineken Cup. The Heineken Cup now had 20 teams divided into four pools of five. Only Leicester and Brive reached the knock-out stages with 100 per cent records and ultimately made it to the final, Cardiff and Toulouse falling in the semi-finals. After 46 matches, Brive beat Leicester 28–9 in front of a crowd of 41,664 at Cardiff Arms Park, the match watched by an estimated television audience of 35 million in 86 countries. The season 1997–98 saw the introduction of a home and away format in the pool games. The five pools of four teams, which guaranteed each team a minimum of six games, and the three quarter-final play-off matches all added up to a 70-match tournament. Brive reached the final again but were beaten late in the game by Bath with a penalty kick. Ironically, English clubs had decided to withdraw from the competition in a dispute over the way it was run. Without English clubs, the 1998–99 tournament revolved around France, Italy and the Celtic nations. Sixteen teams took part in four pools of four. French clubs filled the top positions in three of the groups and for the fourth consecutive year a French club, in the shape of Colomiers from the Toulouse suburbs, reached the final. Despite this it was to be Ulster's year as they beat Toulouse (twice) and reigning French champions Stade Français on their way to the final at Lansdowne Road, Dublin. Ulster then carried home the trophy after a 21–6 win over Colomiers in front of a capacity 49,000 crowd. English clubs returned in 1999–00. The pool stages were spread over three months to allow the competition to develop alongside the nations' own domestic competitions, and the knockout stages were scheduled to take the tournament into the early spring. For the first time clubs from four different nations – England, Ireland, France and Wales – made it through to the semi-finals. Munster's defeat of Toulouse in Bordeaux ended France's record of having contested every final and Northampton Saints' victory over Llanelli made them the third English club to make it to the final. The competition was decided with a final between Munster and Northampton, with Northampton coming out on top by a single point to claim their first major honour. England supplied two of the 2000–01 semi-finalists – Leicester Tigers and Gloucester – with Munster and French champions Stade Français also reaching the last four. Both semi-finals were close, Munster going down by a point 16–15 to Stade Français in Lille and the Tigers beating Gloucester 19–15 at Vicarage Road, Watford. The final, at Parc des Princes, Paris, attracted a crowd of 44,000 and the result was in the balance right up until the final whistle, but Leicester walked off 34–30 winners. Munster reached the 2001–02 final with quarter-final and semi-final victories on French soil against Stade Français and Castres. Leicester pipped Llanelli in the last four, after the Scarlets had halted Leicester's 11-match Heineken Cup winning streak in the pool stages. A record crowd saw Leicester become the first side to successfully defend their title. From 2002, the European Challenge Cup winner now automatically qualified for the Heineken Cup. Toulouse's victory over French rivals Perpignan in 2003 meant that they joined Leicester as the only teams to win the title twice. Toulouse saw a 19-point half-time lead whittled away as the Catalans staged a dramatic comeback in a match in which the strong wind and showers played a major role, but Toulouse survived to win. In 2003–04 the Welsh Rugby Union (WRU) voted to create regions to play in the Celtic League and represent Wales in European competition. Henceforth, Wales entered regional sides rather than the club sides that had previously competed. English side London Wasps had earned their first final appearance by beating Munster 37–32 in a Dublin semi-final while Toulouse triumphed 19–11 in an all-French contest with Biarritz in a packed Stade Chaban-Delmas in Bordeaux. The 2004 final saw Wasps defeat defending champions Toulouse 27–20 at Twickenham to win the Heineken Cup for the first time. The match was widely hailed as one of the best finals. With extra time looming at 20–20, a late opportunist try by scrum half Rob Howley settled the contest. Munster fans watch their team on a jumbo screen on the streets of Limerick. Munster won the 2005–06 Cup and were runners-up twice before. The tenth Heineken Cup final saw the inaugural champions Toulouse battle with rising stars Stade Français when Murrayfield was the first Scottish venue to host the final. Fabien Galthié's Paris side led until two minutes from the end of normal time before Frédéric Michalak levelled the contest for Toulouse with his first penalty strike. He repeated this in the initial stages of extra time and then sealed his side's success with a superb opportunist drop-goal. Toulouse became the first team to win three Heineken Cup titles. In 2006, Munster defeated Biarritz in the Millennium Stadium, Cardiff, 23–19. It was third time lucky for the Irish provincial side, who had previously been denied the ultimate prize twice by Northampton and Leicester. The 2006–07 Heineken Cup would be distributed to over 100 countries following Pitch International's securing of the rights. That season was the first time in the history of the competition that two teams went unbeaten in pool play, with both Llanelli Scarlets and Biarritz doing so. Biarritz went into their final match at Northampton Saints with a chance to become the first team ever to score bonus-point wins in all their pool matches, but were only able to score two of the four tries needed. Leicester defeated Llanelli Scarlets to move into the final at Twickenham, with the possibility of winning a Treble of championships on the cards, having already won the EDF Energy Cup and the Guinness Premiership. However, Wasps won the final 25 points to 9 in front of a tournament record 81,076 fans. In the 2008 final, Munster won the cup for their second time ever by beating Toulouse at the Millennium Stadium in Cardiff. Leinster won the title in 2009 in their first ever final after beating Munster in the semi-final in front of a then world record Rugby Union club match attendance in Croke Park. They beat the Leicester Tigers in the final at Murrayfield Stadium in Edinburgh. They also beat Harlequins 6–5 in the quarter-finals at Twickenham Stoop, in the famous Bloodgate scandal. In the 2010 final, Toulouse defeated Biarritz Olympique in the Stade de France to claim their fourth title, a Heineken Cup record. The 16th Heineken Cup tournament in 2011 resulted in an Irish province lifting the title for the fourth time in six years as Leinster recorded their second triumph in the competition. They defeated former multiple Heineken Cup winners Leicester and Toulouse in the quarter- and semi-finals. At the Millennium Stadium in Cardiff, in front of 72,000 spectators, Leinster fought back from a 22–6 half-time deficit in the final against Northampton Saints, scoring 27 unanswered points in 26 second-half minutes, winning 33–22 in one of the tournament's greatest comebacks. Jonathan Sexton won the man-of-the-match award, having scored 28 of Leinster's points total, which included two tries, three conversions, and four penalties. Leinster successfully defended their crown in 2012 at Twickenham, eclipsing fellow Irish province and former champions Ulster 42–14 to establish the highest Heineken Cup final winning margin. The performance broke a number of Heineken Cup Final records. Leinster became only the second team to win back-to-back titles, and the only team ever to win three championships in four years. In addition, the game had the highest attendance at a final (81,774), the highest number of tries (5) and points (42) scored by one team and the highest points difference (28). The final edition of the tournament as constituted as the Heineken Cup was won for a second time by Toulon at the Millennium Stadium in Cardiff in May 2014. The tournament began on 17 October 2014, with Harlequins playing Castres Olympique in the first ever Champions Cup game. Toulon retained their title, beating Clermont 24–18 in a repeat of the 2013 Heineken Cup Final, thereby becoming the first club to win three European titles in a row. Following the November 2015 Paris attacks, all Round 1 games due to take place in France that weekend were called off, along with the Round 2 fixture between Stade Français and Munster. Rescheduling of some matches was difficult, partly caused by fixture congestion due to the 2015 Rugby World Cup. Saracens won their first title defeating Racing 92 in Lyon 21–9 in 2016 final and followed it up with their second in 2017, beating Clermont 28–17 in Edinburgh. In 2017/2018 season, Leinster overcame the "pool of death" consisting of Glasgow Warriors (who finished the 2017/18 season top of the Guinness Pro14), Montpellier (who finished the 2017/18 season top of the TOP 14) and Exeter (who finished the 2017/18 season top of the Aviva Premiership), beating all three teams both home and away. Leinster went on to face the back to back Champions Saracens, dispatching a defeat at the Aviva Stadium in Dublin, to set up a semi-final against reigning Guinness Pro12 champions Scarlets . Leinster defeated Scarlets to face Racing 92 in Champions Cup Final in Bilbao. Leinster defeated Racing 92 by a scoreline of 15 - 12, becoming only the second team in history to earn four European titles. Leinster capped their 2017/18 season off with more silverware, securing the first ever Guinness Pro14 title in a historic double, never before achieved by any Guinness Pro14 team . In 2017, it was announced that this format would change. Starting with qualification for the 2018–19 competition, the seven Pro14 places will all be assigned regardless of nationality, rather than the requirement that at least one team qualify from each participating nation. The final team each season qualifies through a play-off competition between the best placed unqualified teams. For the 2014–15 season, this was a two legged play-off between the seventh-placed teams in the Top 14 and the English Premiership. The team with the highest aggregate score over the two legs advancing to the Champions Cup. For the 2015–16 season, there was a three-team play-off; the seventh-placed team in the English Premiership, or the winners of the 2014–15 European Rugby Challenge Cup if members of the English Premiership and not already qualified, would play the eighth-placed (or highest non-qualified) team from the Pro14, with the winner playing the seventh-placed team in the Top 14. To facilitate Rugby World Cup 2015, there were no play-offs for the 2016–17 Champions Cup with the 20th place going to the winner of the 2016 Challenge Cup if not already qualified. For 2017–18, the play-off format will include four clubs with a second Pro14 club competing. If not already qualified, the winner of the Challenge Cup will take the place in the play-offs of the seventh-ranked club in the Aviva Premiership and Top 14, and will also take the place of the second Pro14 club if applicable. Champions Cup winner, if not already qualified. European Rugby Challenge Cup winner, if not already qualified. Challenge Cup losing finalist, if not already qualified. Challenge Cup semi-finalist, if one has not already qualified (or the winner of a play-off between the semi-finalists, if both have not already qualified). Highest ranked non-qualified club by virtue of league position from the same league as the Champions Cup winner. For the pool stage there are five pools of four teams. The teams are ranked based on domestic league performance the previous season, and arranged into four tiers of five teams. Teams are then drawn from the tiers into pools at random, with the restriction that no pool shall contain two teams from the same country or league, until the allocation of Tier 4, which contains the sixth English and French teams, the sixth and seventh Pro14 team and the winner of the play-off. Teams will play the other three teams in the pool twice, at home and away, and match points will be awarded depending on the result of each game, with teams receiving four points for a win, and two for a draw. Teams can also earn bonus points for scoring four or more tries and/or for losing a match by seven points or fewer. Following the completion of the pool stage, the five pool winners, and the three best pool runners-up qualify for the knock-out stage. The eight quarter-finalists are seeded – pool winners from 1–5, and runners-up from 6–8 – based on performance in their respective pool. The four pool winners with the best pool record receive home advantage for the quarter-finals against one of the lower-seeded teams. The quarter-final are unbracketed, and follow the standard 1v8, 2v7, 3v6, 4v5 format, as found in the Heineken Cup. The winners of the quarter-finals will contest the two semi-finals, Up to and including the 2014–15 season, matches and home country advantage were determined by a draw by EPCR. In 2015–16 EPCR decided to put a new procedure in place. In lieu of the draw that used to determine the semi-final pairing, EPCR announced that a fixed semi-final bracket would be set in advance, and that the home team would be designated based on "performances by clubs during the pool stages as well as the achievement of a winning a quarter-final match away from home". Semi-final matches must be played at a neutral ground in the designated home team's country. The winners of the semi-finals will contest the final, which will be held no later than the first weekend of May each season. English and French rugby union clubs had long held concerns over the format and structure of the Heineken Cup organised by European Rugby Cup (ERC), predominantly in relation to the distribution of funds and an imbalance in the qualification process. Some proposals had been made that, in future, rather than Ireland, Wales, Scotland and Italy each sending their top-placed teams in the Pro14 to the Heineken Cup, the top teams from the league as a whole should be sent, regardless of nationality. This founding principle was eventually conceded however, when it was agreed that the top-placed teams from the four should participate in the new European competition. In June 2012, following that year's final, Premiership Rugby and the Ligue Nationale de Rugby (LNR), on behalf of the English and French clubs respectively, gave ERC two years' notice of withdrawing from the Heineken Cup and also the second-tier Challenge Cup competitions from the start of the 2014–15 season. Soon after, in September, Premiership Rugby announced a new four-year TV deal worth £152 million with BT Sport including rights for English clubs’ European games - which had previously been the sole responsibility of ERC. ERC responded with claims that Premiership Rugby did not have the rights to a European tournament and announced a four-year deal with Sky Sports. The actions of Premiership Rugby were said to have "thrown northern hemisphere rugby into disarray". Subsequently, in September 2013, the English and French clubs announced their intention to organise their own tournament, to be named the Rugby Champions Cup, from 2014–15 season onwards, and invited other European clubs, provinces, and regions to join them. The IRB (now World Rugby) stepped into the debate at the same time to announce its opposition to the creation of a breakaway tournament. In October 2013, Regional Rugby Wales, on behalf of the four Welsh regions, confirmed its full support for the proposed new Rugby Champions Cup. Negotiations for both a new Heineken Cup and Rugby Champions Cup were then ongoing. On 10 April 2014, following almost two years of negotiations, a statement was released under the aegis of European Professional Club Rugby (EPCR) announcing that the nine stakeholders to the new competition, the six unions, and three umbrella club organisations (Premiership Rugby, LNR, and Regional Rugby Wales), had signed Heads of Agreement for the formation of the European Rugby Champions Cup, the European Rugby Challenge Cup and a new, third tournament, initially called the Qualifying Competition and now known as the European Rugby Continental Shield. On the same day, BT and Sky announced an agreement that divided coverage of the new European competitions. Both will split the pool matches, quarter-finals, and semi-finals equally, and both will broadcast the final. BT will get first choice of English Premiership club matches in the Champions Cup, with Sky receiving the same privilege for the Challenge Cup. Premiership Rugby and LNR were described as having employed "bully-boy tactics" by The Irish Times. Shortly after the establishment of European Professional Club Rugby (EPCR) to administer the new competition from a new base in Neuchatel, Switzerland, the running of the inaugural 2014–15 tournament was subcontracted to the organisation it had been meant to replace, Dublin-based European Rugby Cup (ERC). This was despite the latter having been described by chairman of Premiership Rugby, Quentin Smith, as "no longer fit for purpose". This was described as "something of an about-turn" by The Daily Telegraph. EPCR were still looking to hire a permanent chairman and director-general more than a year after their establishment. The inaugural Champions Cup final was brought forward by three weeks due to a French desire not to interrupt their domestic playoffs. This was said to have "devalued" and "diminished the status of the occasion as the pinnacle of European club rugby". While the 2015 Heineken Cup final had been due to take place at the San Siro in Milan, the first European final to take place in Italy, the new organisers decided to move it to Twickenham Stadium in London in order to "guarantee the best possible financial return to clubs". However, with less than two weeks to go before the final took place, it was reported that fewer than half of the stadium's 82,000 seats had been sold, with just 8,000 French supporters travelling to London to watch Toulon face Clermont. The organisers subsequently made "free" tickets available on Ticketmaster (with only a £2 booking fee applicable), before admitting to this being a mistake – the offer supposed to have been linked to a purchase of a Premiership final ticket. This was described as an "embarrassing fiasco" by the Western Mail in Wales. 56,622 fans subsequently attended the game. EPCR were said to have "failed on many levels" by The Irish Times, with the attendance figure for the final "a fitting postscript to the hastily-convened decider to what was, after all the brinkmanship, a hastily-convened tournament". 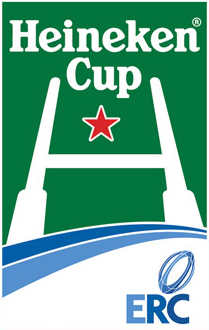 During the creation of the Champions Cup, former organisers ERC had been criticised for "failing to maximise the commercial potential" of the Heineken Cup. New organisers EPCR pledged to move from a single title sponsor format to a Champions League-style partner system, with 2–3 primary partners projected for the inaugural tournament and 5 being the ultimate target. However, only Heineken agreed to sign up for the 2014–15 season, at a much reduced price from that which they had been paying previously. Heineken, who had sponsored the Heineken Cup since 1995, signed on as the first partner for the Champions Cup in 2014, and were credited as the Founding Partner of European Rugby. They returned to the competition as title sponsors in 2018, resulting in it being renamed as the "Heineken Champions Cup". Following their appointment as an official supplier, Tissot began sponsoring the match officials' kit. Note that in the case of career statistics, only those clubs for which each player appeared in European Cup fixtures (i.e. Heineken Cup or Champions Cup) are listed. Players in BOLD still playing for an EPRC qualified team. The number of goals includes both penalties and conversions. The European Player of the Year award was introduced by ERC in 2010. Ronan O'Gara received the inaugural award, being recognised as the best player over the first 15 years of ERC tournaments. Following the creation of the European Rugby Champions Cup, the new organisers, EPCR, continued to award a Player of the Year accolade, with the first going to Nick Abendanon of Clermont Auvergne. The European Rugby Champions Cup trophy was unveiled in October 2014. Crafted by Thomas Lyte, the trophy is made of mixed metals including sterling silver and 18ct gold plating. The cup is designed around the idea of the star representing European rugby, including the previous 19 seasons of European rugby, as the Heineken Cup. EPCR was criticised for forcing U.K. and Irish fans beginning in 2015 to subscribe to two pay-TV companies, Sky Sports and BT Sport, if they wanted to follow their teams throughout the Champions Cup. Coverage was split between the two in order to raise revenues, but this was said to have "diluted the focus and reduced the buzz around the event". This lists the average attendances for each season's European Cup competition, as well as the total attendance and highest attendance for that season. The final is typically the most-attended match, as it is generally held in a larger stadium than any club's home venue. The highest attended match of the 2002–03 competition was a quarter-final between Leinster and Biarritz before 46,000 fans at Lansdowne Road in Dublin. The 2009 final held at Murrayfield Stadium in Edinburgh was only the third most-attended match that season. The most-attended match was a semi-final between Irish rivals Leinster and Munster played in Croke Park in Dublin. The attendance of 82,208 set what was then a world record for a club match in the sport's history. Second on that season's list was a pool match between Stade Français and Harlequins that drew 76,569 to Stade de France in Paris (a venue that Stade Français has used for select home matches since 2005). While the 2010–11 tournament's highest attended match was unsurprisingly the final, the second-highest attended match was notable in that it was held in Spain. Perpignan hosted Toulon in a quarter-final before a sellout crowd of 55,000 at the Olympic Stadium in Barcelona, Spain. ^ a b c "European Rugby Cup : History". ERC. Archived from the original on 8 February 2007. Retrieved 21 March 2007. ^ a b "European Rugby Cup : Heineken Cup History 1995/96". ERC. Archived from the original on 15 March 2007. Retrieved 21 March 2007. ^ a b Rees, Paul (30 March 2006). "Big boys plan for more lucrative Heineken Cup". The Guardian. London. Retrieved 21 March 2007. ^ a b "A history of the Heineken Cup". Nobok. Archived from the original on 16 July 2011. Retrieved 1 April 2007. ^ a b "European Rugby Cup : Heineken Cup History 1996/97". ERC. Archived from the original on 18 January 2007. Retrieved 21 March 2007. ^ a b "European Rugby Cup : Heineken Cup History 1997/98". ERC. Archived from the original on 8 February 2007. Retrieved 21 March 2007. ^ a b "Stade Francais 12–18 Toulouse". BBC. 22 May 2005. Retrieved 21 March 2007. ^ "Munster 23–19 Biarritz". BBC. 20 May 2006. Retrieved 21 March 2007. ^ "2006–07 Heineken Cup delivered to over 100 countries". Sport Business. 31 October 2006. Archived from the original on 9 February 2007. Retrieved 21 March 2007. ^ "Waspss crowned club champions in front of world record crowd". ERC. 20 May 2007. Archived from the original on 8 July 2007. Retrieved 15 June 2007. ^ "French clubs to quit Heineken Cup". BBC. 17 January 2007. Retrieved 17 January 2007. ^ "French blame RFU for Heineken Cup boycott". RTÉ Sport. 17 January 2007. Retrieved 17 January 2007. ^ Jones, Stephen (9 April 2007). "Low division likely to fill Europe spots". Australian. Retrieved 9 April 2007. ^ "ERC Press Statement". ERC. Archived from the original on 30 September 2007. Retrieved 20 May 2007. ^ Watterson, Johnny. "Leinster turn the tide". The Irish Times. Retrieved 22 May 2011. ^ "Leinster enter record books". ERC. Archived from the original on 16 September 2012. Retrieved 20 May 2012. ^ St, James; Sport, ley BBC. "European Rugby Champions Cup final: Toulon secure hat-trick". ^ "European Champions Cup: Postponed ties to be rescheduled". ^ "European Rugby Champions Cup: Stade Francais-Munster game off". ^ Spink, Alex (15 November 2015). "Toby Flood learns La Marseillaise in wake of Paris attacks for Toulouse clash". ^ "Proposed date for postponed European Cup tie would hurt England's Six Nations hopes - JOE.co.uk". ^ "Games must go ahead to respect Paris victims - Independent.ie". ^ a b "EPCR announces key changes to Champions Cup qualification". epcrugby.com. ^ a b "European Rugby Champions Cup (EPCR)". ^ "Watch the Champions Cup and Challenge Cup Pool Draws live". ERCRugby.com. Archived from the original on 31 October 2014. Retrieved 8 June 2014. ^ a b c "European Rugby Champions Cup (EPCR)". ^ "Future of European Rugby resolved" (Press release). Rugby Football Union. 10 April 2014. Archived from the original on 25 May 2014. Retrieved 10 April 2014. ^ "New Tournament formats agreed". epcrugby.com. European Professional Club Rugby. Archived from the original on 22 June 2014. ^ "French clubs withdraw threat to down Heineken". 10 January 2007. ^ Reid, Alasdair. "Scots approach Welsh proposal with caution". The Daily Telegraph. London. Retrieved 11 August 2008. ^ Foy, Chris (10 September 2013). "English and French clubs pull out of Heineken cup and pledge to go it alone". The Daily Mail. London. Retrieved 1 October 2013. ^ Thomas, Simon (14 September 2012). "Analysis: Does English TV deal spell end of Heineken Cup?". ^ "Anglo-French breakaway plan from rugby Heineken Cup not ideal: IRB chief Brett Gosper". ^ "Welsh regions support Champions Cup". ESPN Scrum. 22 October 2013. Retrieved 23 October 2013. ^ "Background to the European rugby dispute". BBC Sport. 22 October 2013. Retrieved 23 October 2013. ^ "New identity for the Challenge Cup Qualifying Competition" (Press release). European Professional Club Rugby. 31 March 2017. Retrieved 30 November 2017. ^ "BT and Sky sign joint agreement over European rugby". ESPN Scrum. 10 April 2014. Retrieved 10 April 2014. ^ a b c d "European Cup's unique sense of occasion wins out despite final flaws". ^ "European Rugby Cup officials seconded to run the inaugural European Rugby Champions Cup". ^ a b c d e f Thomas, Simon (28 April 2015). "Has rugby's new Europe actually worked?". ^ Kitson, Robert (20 April 2015). "European Champions Cup organisers fear half-empty Twickenham final" – via The Guardian. ^ "Free Champions Cup final ticket offer a mistake, claim organisers - SportsJOE.ie". ^ "Heineken returns as Champions Cup title partner". epcrugby.com. European Professional Club Rugby. 4 June 2018. Retrieved 4 June 2018. ^ "European Professional Club Rugby (EPCR)". ^ "Heineken Cup: Try Scorers". ERC. Retrieved 25 May 2014. ^ "Heineken Cup: Points Scorers". ERC. Retrieved 25 May 2014. ^ "Heineken Cup: Goal Kickers". ERC. Retrieved 25 May 2014. ^ "Heineken Cup: Appearances". ERC. Retrieved 25 May 2014. ^ "David Wallace". ERC. Retrieved 25 May 2014. ^ "Heineken Cup: Try Scorers 2013-14". ERC. Retrieved 25 May 2014. ^ "Heineken Cup: Try Scorers 1996-97". ERC. Retrieved 25 May 2014. ^ "Heineken Cup: Try Scorers 2000-01". ERC. Retrieved 25 May 2014. ^ "Heineken Cup: Try Scorers 2004-05". ERC. Retrieved 25 May 2014. ^ "Heineken Cup: Try Scorers 2011-12". ERC. Retrieved 25 May 2014. ^ "Heineken Cup: Try Scorers 2012-13". ERC. Retrieved 25 May 2014. ^ a b c "Heineken Cup: Points Scorers 2000-01". ERC. Retrieved 25 May 2014. ^ "Heineken Cup: Points Scorers 1998-99". ERC. Retrieved 25 May 2014. ^ "Heineken Cup: Points Scorers 2010-11". ERC. Retrieved 25 May 2014. ^ a b "Heineken Cup: Points Scorers 1997-98". ERC. Retrieved 25 May 2014. ^ "Heineken Cup: Points Scorers 1999-00". ERC. Retrieved 25 May 2014. ^ "Heineken Cup: Points Scorers 2005-06". ERC. Retrieved 25 May 2014. ^ "Heineken Cup: Points Scorers 2001-02". ERC. Retrieved 25 May 2014. ^ "European Player of the Year". European Professional Club Rugby. ^ "Euro cup has to wait for new sponsors". ESPN. 7 October 2014. Retrieved 10 October 2014. ^ "European Rugby Cups unveiled ahead of kick off". 7 October 2014. ^ "Prestigious new European Professional Club Rugby trophies unveiled". Premiershiprugby.com. 4 October 2014. Retrieved 10 October 2014. ^ Thornley, Gerry. "Leinster bring all the emotion, the intelligence and the rugby". The Irish Times. The 2014–15 European Rugby Champions Cup was the first season of the European Rugby Champions Cup (20th overall), the annual rugby union club competition for teams from the top six nations in European rugby, and the 20th season of professional European rugby union in total. It replaced the Heineken Cup as Europe's top-tier competition for rugby clubs. The competition got underway on the weekend of 17 October 2014 with the first round of the pool stage, and ended with the final on 2 May 2015 at Twickenham Stadium, London, England.Toulon were the champions having beaten Clermont 24–18 in a repeat of the 2013 Heineken Cup Final. Toulon retained their title for the second consecutive year, the first team to win three European titles in a row. The 2014–15 European Rugby Champions Cup pool stage was the first stage of the 20th season of European club rugby union, and the first to be organised under the new European Rugby Champions Cup format, which replaced the Heineken Cup as the top European competition for clubs. It involved 20 teams competing, across 5 pools of 4 teams, for 8 quarter-final places – which were awarded to the 5 pool winners and the 3 top-ranked pool runners-up. The pool stage began on the weekend of 17–19 October 2014, and was completed on the weekend of 23–25 January 2015. The 2014–15 European Rugby Champions Cup-Challenge Cup play-off was the first play-off for entry into the top level competition of European Club rugby union, the European Rugby Champions Cup. In March 2014, following the announcement of new European club competitions, the European Rugby Champions Cup and the European Rugby Challenge Cup, it was announced that the final place in the Champions Cup competition would be awarded by a play-off. For the 2014–15 season, this was a two-legged play-off between the seventh placed teams from the 2013–14 Aviva Premiership season, and the 2013–14 Top 14 season. Following the completion of both legs, the team with the highest aggregate score took the twentieth berth in the 2014–15 European Rugby Champions Cup, the new top tier competition, while the loser will play in the second tier 2014–15 European Rugby Challenge Cup. The 2015 European Rugby Champions Cup Final was the final match in the first European Rugby Champions Cup, and the twentieth European club rugby final in general, as the competition replaces the Heineken Cup. The final was played between the French clubs Clermont and Toulon at Twickenham Stadium on 2 May 2015. Toulon won the final, beating Clermont by 24 points to 18. This was the third successive win by Toulon of the top European club rugby competition. The 2015–16 European Rugby Champions Cup was the second European Rugby Champions Cup championship (21st overall), the annual rugby union club competition for teams from the top six nations in European rugby. The European Rugby Champions Cup replaced the Heineken Cup, which was Europe's top-tier competition for rugby clubs for the first nineteen years of professional European rugby union.As a result of the 2015 Rugby World Cup being held in England, the tournament started slightly later than in previous seasons, with the opening round taking place on the weekend of 13/14/15 November 2015. The tournament was won for the first time by Saracens who beat Racing 92 in the final on the 14 May 2016, at Parc Olympique Lyonnais (called "Grand Stade de Lyon" by competition organiser European Professional Club Rugby) in the Lyon suburb of Décines. The 2015–16 European Rugby Champions Cup pool stage was the first stage of the 21st season of European club rugby union, and the second under the European Rugby Champions Cup format. It involved 20 teams competing, across 5 pools of 4 teams, for 8 quarter-final places – awarded to the 5 pool winners and the 3 top-ranked pool runners-up. The pool stage began on the weekend of 13 November 2015 but several games were postponed following the November 2015 Paris attacks. It was completed on the weekend of 23–25 January 2016. The 2015–16 European Rugby Champions Cup-Challenge Cup play-off was the second play-off for entry into the top level competition of European Club rugby union, the European Rugby Champions Cup. The 2016 European Rugby Champions Cup Final was the final match in the 2015–16 European Rugby Champions Cup, and the twenty-first European club rugby final in general. It was contested by French side Racing 92, and Saracens of England, at the Grand Stade de Lyon, in the Lyon suburb of Décines, France, on Saturday 14 May 2016. Saracens defeated Racing 92 by 21 points to 9. This was Saracens first European Cup win, making them the first new champions since Toulon, whose first victory in what was then known as the Heineken Cup came in 2013. The 2016–17 European Rugby Champions Cup was the third European Rugby Champions Cup championship (22nd overall), the annual rugby union club competition for teams from the top six nations in European rugby. The competition replaced the Heineken Cup, which was Europe's top-tier competition for rugby clubs for the first nineteen years of professional European rugby union. The opening round of the tournament took place on the weekend of 14/15/16 October 2016. The final took place on 13 May 2017 at Murrayfield in Edinburgh.English side Saracens were the 2015–16 champions, having beaten Racing 92 of France in the 2016 final in Lyon. Saracens retained the cup, defeating Clermont in the final 28–17. The 2016–17 European Rugby Champions Cup pool stage was the first stage of the 22nd season of European club rugby union, and the third under the European Rugby Champions Cup format. The pool stage began on the weekend of 14–16 October 2016, and ended following Round 6, on the weekend of 23–25 January 2017. The 2017 European Rugby Champions Cup Final was the final match in the 2016–17 European Rugby Champions Cup, and the twenty-second European club rugby final in general. It was contested by defending champions Saracens of England and French side Clermont at Murrayfield Stadium, in Edinburgh, Scotland, on Saturday 13 May 2017. Saracens retained the trophy after claiming a 28–17 victory. The 2017–18 European Rugby Champions Cup was the fourth European Rugby Champions Cup championship (23rd overall), the annual rugby union club competition for teams from the top six nations in European rugby and was the twenty-third season of pan-European professional club rugby competition. The format of the competition began with a play-off qualification round at the end of the preceding season featuring teams from England, France, Ireland and Wales. The winner joined 19 teams already qualified by way of their domestic league position in the pool stage of the competition - a home and away round-robin for five groups of four teams. Following the pool stage, five pool winners, and three highest ranked runners-up, qualified for the quarter-finals of the competition, as the Cup thereafter reverted to a single elimination knockout format. The tournament began on 13 October 2017. The final was won by Leinster on 12 May 2018 at San Mamés Stadium in Bilbao, Spain. This was Leinster's fourth title, tying the record for the most successful team in the competition's history. This was the first time the final was held outside one of the Six Nations countries. The 2017–18 European Rugby Champions Cup pool stage is the first stage of the 23rd season of European club rugby union, and the fourth under the European Rugby Champions Cup format. The competition involves twenty teams, across five pools of four teams, for eight quarter-final places – awarded to the five pool winners and the three top-ranked pool runners-up. The pool stage began on the weekend of 13–15 October 2017, and ended following round 6, on the weekend of 19–21 January 2018. The 2017–18 European Rugby Champions Cup-Challenge Cup play-off was the third play-off for entry into the top level competition of European Club rugby union, the European Rugby Champions Cup. The 2018 European Rugby Champions Cup Final was the final match in the 2017–18 European Rugby Champions Cup, and the twenty-third European club rugby final in general. Irish club Leinster defeated French club Racing 92 in the final played in Bilbao, Spain — the first time it was contested outside one of the Six Nations countries. The 2018–19 European Rugby Champions Cup (known as the Heineken Champions Cup for sponsorship reasons) is the fifth season of the European Rugby Champions Cup, the annual club rugby union competition run by European Professional Club Rugby (ECPR) for teams from the top six nations in Europe. It is the 24th season of pan-European professional club rugby competition. This competition will be the first to be sponsored by Heineken since the 2013–14 season. The tournament started on 12 October 2018. The final, featuring the last two winners of the event, Saracens and Leinster, will take place on 11 May 2019 at St James' Park in Newcastle upon Tyne, England. The 2019 European Rugby Champions Cup Final will be the final match in the 2018–19 European Rugby Champions Cup, and the twenty-fourth European club rugby final in general. The 2019–20 European Rugby Champions Cup (known as the Heineken Champions Cup for sponsorship reasons) is the sixth season of the European Rugby Champions Cup, the annual club rugby union competition run by European Professional Club Rugby (ECPR) for teams from the top six nations in European rugby. It will be the 25th season of pan-European professional club rugby competition. The tournament will begin in November 2019. The final will take place on 23 May 2020 at Stade de Marseille in Marseille, France. The European Rugby Champions Cup is an annual rugby union competition for European clubs whose countries compete in the Six Nations Championship. Introduced in 2014, the competition replaced the Heineken Cup, which had been run by European Rugby Cup (ERC) since 1995, following disagreements between its shareholders over the structure and governance of the competition. It is organised by European Professional Club Rugby (EPCR), with teams qualifying via their final positions in their respective national/cross-border leagues (Premiership, Top 14, and Pro14). The winners of the first final were French team Toulouse, who beat Welsh side Cardiff 21–18 after extra time. Irish side Leinster are the current champions, having beaten French team Racing 92 15–12 in the 2018 final in Bilbao.20 teams initially compete in five separate pools. The top eight teams from the pools progress to the knockout stage. If the score in a knockout match is a draw after 80 minutes of regular play, an additional 20-minute period of play, called extra time, is added. If the score remains tied, an additional 10 minutes of sudden-death extra time are played, with the first team to score points immediately declared the winner. If no team is able to break the tie during extra time, the winner is ultimately decided by a penalty shootout. As well as the first final, the 2005 final between French teams Toulouse and Stade Français went to extra time, which Toulouse won 18–12.Toulouse and Leinster are the most successful teams in the history of the tournament, with four wins each. Toulon are second with three wins. Toulon are the only team to have won three consecutive tournaments, from 2013 to 2015. Three teams have played in more than one final and failed to win any of them—Clermont three times, Racing 92, Stade Français and Biarritz twice. No teams from Scotland and Italy have progressed to the final. The 2017–18 final was held in Bilbao, marking the first time that the final was contested in a country without a team participating in the competition. The 2018–19 final will be held in Newcastle and the 2019-20 final will be held in Marseille.